For me, one of the best parts of any Walt Disney World Resort vacation is the planning! Deciding on when to go, where to stay, what restaurants we must experience and which rides we can’t miss! However, even a seasoned Disney traveler can get overwhelmed when compiling all the details that go into a week long Disney vacation. The first piece of advice I give to any future traveler is to find a place to stay organized, and I do this by keeping all my information in a binder. It’s a cheap and easy way to keep my thoughts, plans, wishes and ever important documentation, in one location! And it always travels to Disney with me! So you may be wondering, what goes into a successful Disney Planning Binder? My answer is everything! From compiling hotel quotes, to crowd calendars, to every draft of an itinerary until the final one is done, the binder becomes my “Disney Bible” essentially. Over the years I have used many kinds, but recently I decided to treat myself to a custom made one! Now I will just take the information out once my trip is completed and re-use the binder and tabs for the next one! (It is always best to plan your next trip immediately after your last trip has ended, it helps to calm the DDB-Disney Departure Blues! What? That is a real medical term!) Although there is no one perfect binder for everyone or even every type of trip, I am going to share with you what goes into my basic Disney Planning Binder. From here you can take the things that work, and then add your own personal touches to make one that is perfect for you! A 2″ binder, dividers (preferably with an index page,) a 3 ring hole punch and a few page protectors. When I am newly planning, all my quotes go here until the final one is decided. Then I use this tab for the confirmation paperwork and receipt. After I decide on my dates and lodging, it’s time to come up with an itinerary. During the planning process this is where I keep all the crowd calendars I use, and preliminary plans until I come up with the final one. I keep a one page running to-do check list here, but in addition to that I also keep a calendar with dates. Some important dates are your ADR date (the date you can make Advance Dining Reservations,) the dates payments are due, the date to make Fast Pass+ Reservations, etc. While planning I start with a wish list and use this tab to decide on what I am going to book and when. When my ADR date comes around, I have all my restaurant choices in order of how difficult they will be to reserve and go down the list when making my reservations. Once my choices are reserved, I use this space to collect all the confirmations I receive from Disney. In addition to ticket receipts, this is a good place for a page protector to hold any hard tickets you may receive. I always link tickets to my Disney reservation however it is nice to hang onto the hard copies just in case you have any issues. I use this space to keep confirmation of special event tickets I may have purchased and information for tours, Mickey’s Very Merry Christmas Party, Mickey’s Not So Scary Halloween Party, etc. Although I always research this information ahead of time, Disney has begun to send out resort information such as maps and hotel itineraries ahead of your arrival. I love to have a map of the resort ahead of time, and if I am staying in a DVC (Disney Vacation Club) resort, I will also print out the hotel amenities such as what is included in the kitchen and keep it here as a reference as well. I usually plan on breakfast in our rooms so I love to use a grocery service, like Garden Grocer. I keep all that information here including a list of what I normally get so it makes it pretty easy to order. I keep a page protector here to collect receipts at the end of each day on vacation and store them in one place. That way when I return and look over my bills I can easily find the corresponding receipts if I need to. Also, anything that did not fit into a category above will find a home here. 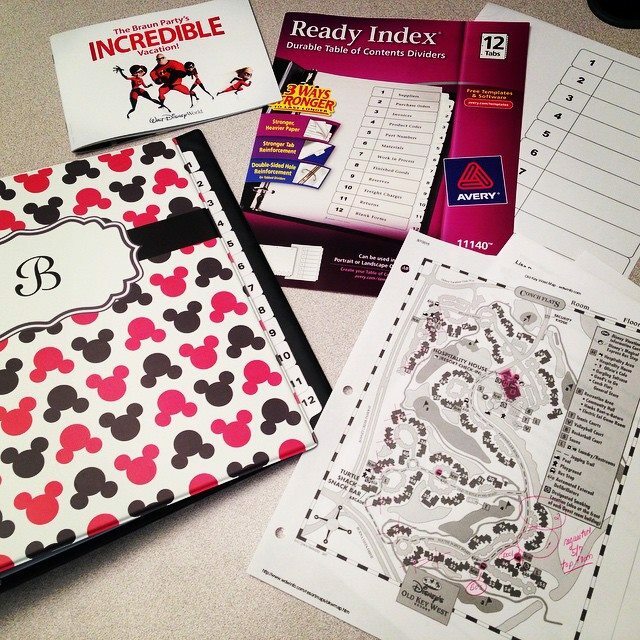 I hope this has helped you get started making your own binder, and if you are like me, get excited about one of the best parts of a Walt Disney World Resort vacation- the planning! As always, if you have questions about planning a Walt Disney World Resort vacation and you want advice from someone with a wealth of Disney experience, email me at distripqueen@gmail.com. I am not affiliated with any travel company, I’m just a mom who loves to make Disney memories with her family and enjoys helping others make theirs! I love it! I do the same thing. I even go as far as to make little laminated 6×4 cards with reservation numbers for ADRs, FP times and other things we want to see just in case MDE goes down or heaven forbid my battery dies. What a great idea! I usually take screen shots of my FP+ times so I can access them quickly without using too much of my battery, but I do take lots of pics with my iphone so I may be doing that in the future as well!